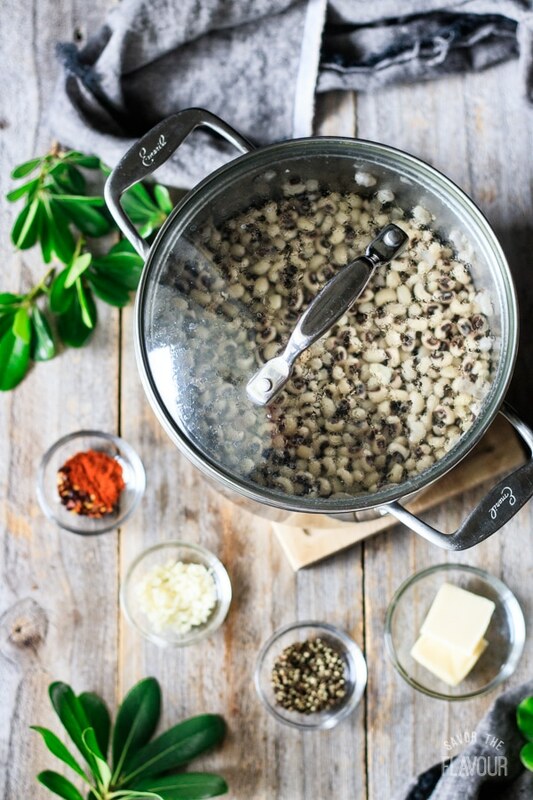 Black eyed peas is a popular Southern side dish that is traditionally served for good luck on New Year's Day. Learn how to cook this healthy stovetop recipe for your special dinner. It's easy to keep warm in a crock pot for church potlucks and open houses. This post was originally published on October 19, 2017. 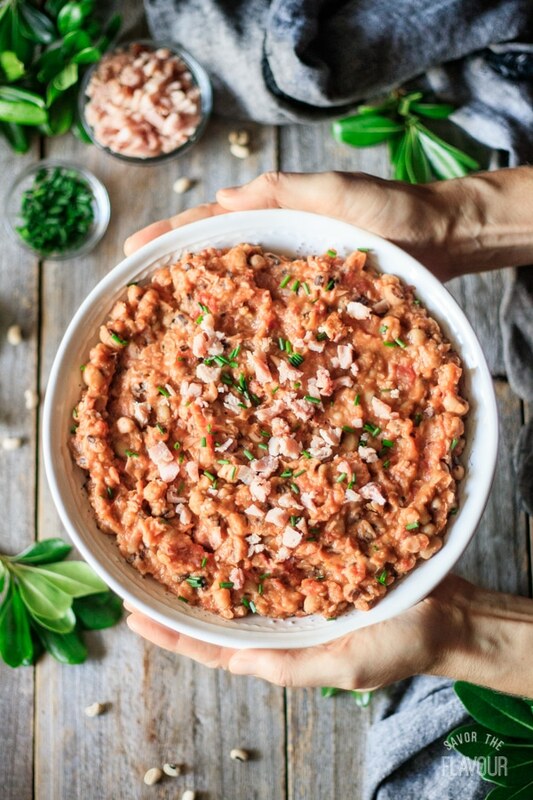 Black-eyed peas are traditionally served on New Year’s Day in the south, but this dish is too good to only serve once a year. Do you want to know the special ingredients? A meaty ham bone combined with the following three spices: cayenne pepper, red pepper flakes, and black pepper. Adding chicken broth instead of water will also increase the flavor. 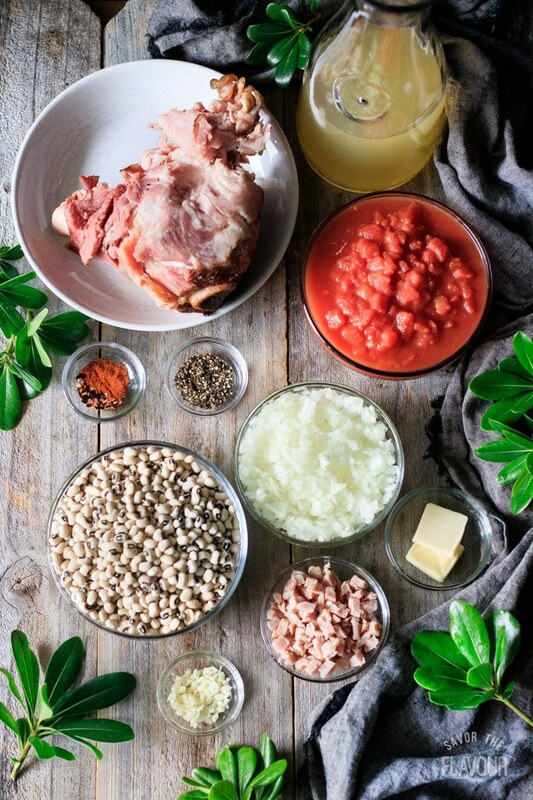 Cutting the meat off from the ham bone and stirring it into the black-eyed peas will make this vegetable side dish almost irresistible. Sprinkle chopped green chives and shredded ham over each serving and it will be perfect. Do the black eyed peas have to be soaked overnight? No, you can use the quick soaked method if you’re short on time. Sort and rinse your dried black eyed peas. Place in a pot, and cover the peas with water. Over medium high heat, boil for 2 minutes. Remove from heat. Keep the lid on. Let stand for one hour. Drain and rinse with fresh cold water. Why do people eat black eyed peas for New Years? 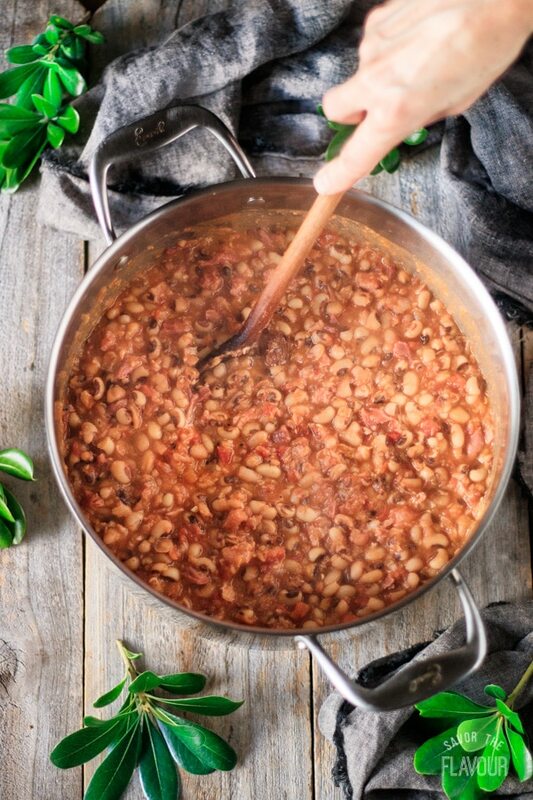 Some people in the Southeastern part of the United States believe that you eat black eyed peas on new year’s day, it will bring you good luck. This belief dates back to the American Civil War where some people say that’s the only thing many slaves had to eat on January 1, 1863 when the Emancipation Proclamation took effect. 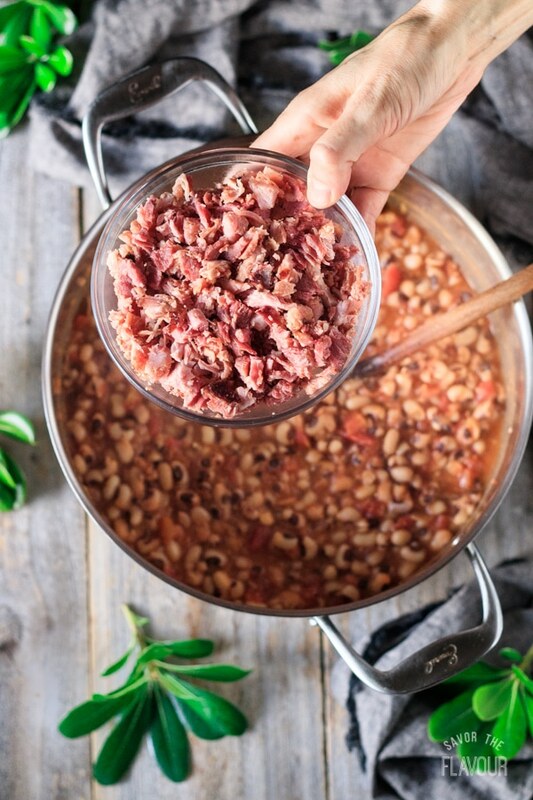 Others believe General Sherman’s troops left the black eyed peas when he marched through Georgia because he considered it pig’s food. Traditionalist’s also believe you need to eat exactly one pea for each day of the year, and it has to be eaten with pork (ham) and (collard) greens. I don’t know about you, but that sounds like a lot of black eyed peas to me, so if you are planning on eating that many peas, it better taste good. 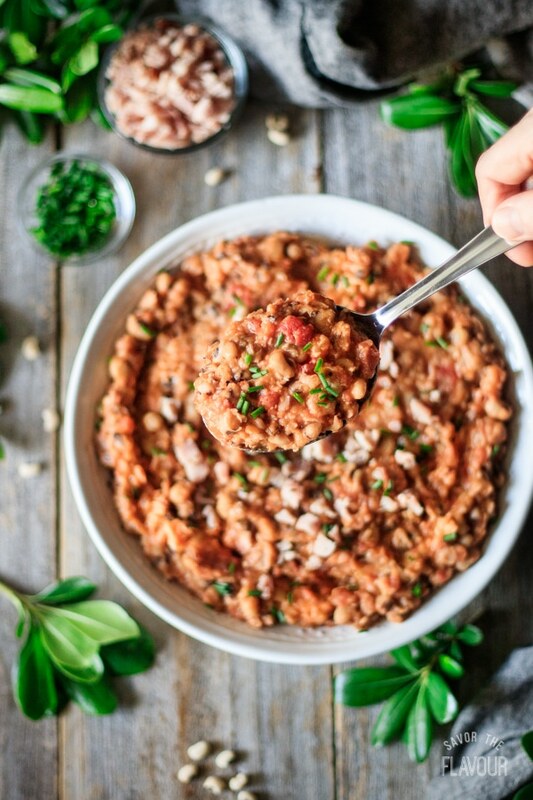 Rest assured, you’ll have no problem eating a second helping of our black eyed pea recipe. Continue reading to find out how its done. 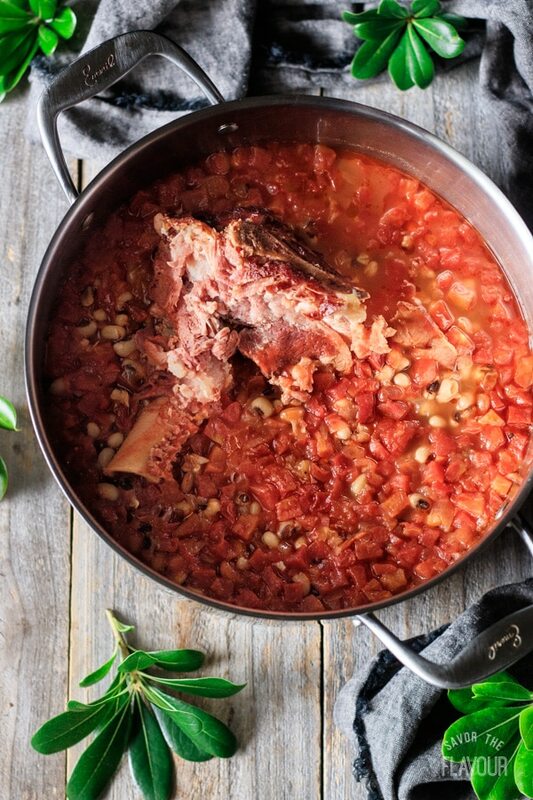 How do you make black eyed peas in a crock pot? Don’t pre-soak the beans, add them in dry. Add the quarterd onion, smashed garlic cloves, diced tomatoes, spices, and the meaty ham bone. If you have an oval shaped crock pot, use 6 cups chicken broth. Use a little less if your crock pot is the standing pot shape. Cook on low for 8 to 10 hours. Remove the ham bone. Let cool. Cut the meat off and return to crock pot. 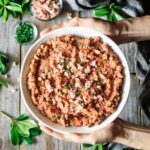 Garnish with extra shredded ham and chopped chives. Start by gathering the ingredients, then chopping the onion and garlic. To quick soak the black eyed peas, sort and rinse them. Place in a medium sized pot and cover with water. Over medium high heat, bring it to a boil and let it boil for 2 minutes. Remove from heat and let it sit covered for one hour. Resist the temptation to stir it; keep the lid on so it stays hot. 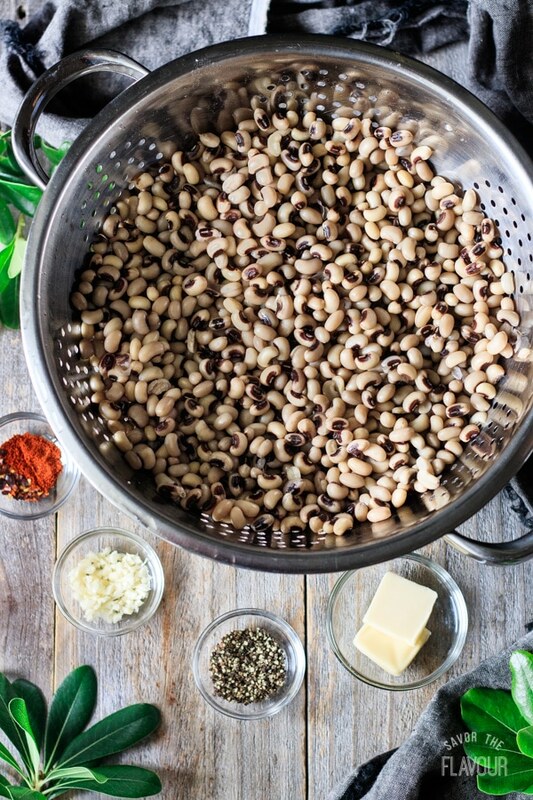 Drain and rinse the black eyed peas in a large colander. Melt the butter in a large pot over medium high heat. Cook the onion until soft, then add the garlic. Add the black eyed peas, diced tomatoes, chicken stock, and spices. Stir until well combined, then add the meaty ham bone. Cover the pot. Bring to a boil over medium-high heat, then reduce the heat to medium low and simmer for 30 minutes, stirring occasionally. 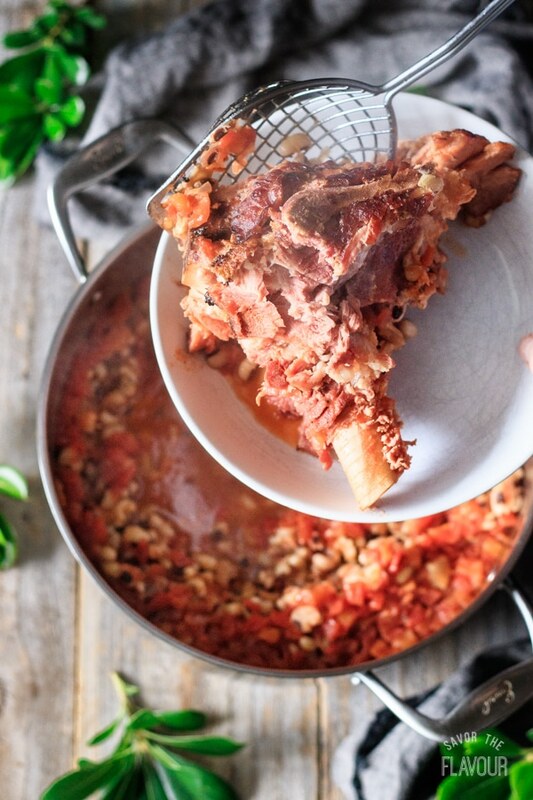 Remove the meaty ham bone with a large slotted spoon. Place on a plate to cool. Place the lid back on the pot and continue to simmer for another 30 minutes, stirring every once and a while. Once the ham bone is cool, cut off the meat and finely chop it. Add the meat to the pot and stir until well mixed. Taste and adjust seasonings, if necessary. Serve warm with fresh cornbread, collard greens, and baked ham for a traditional Southern New Year’s Day menu. One taste and you’ll be converted. 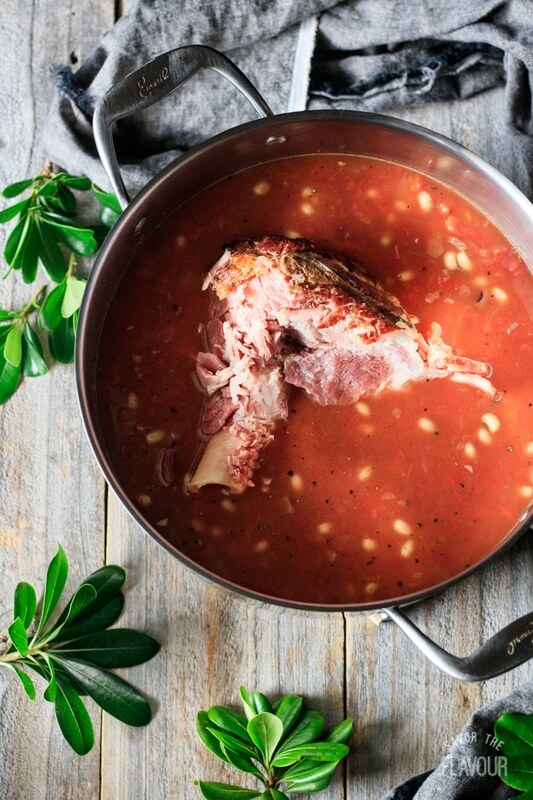 Black-eyed peas and ham is a winning combination! It’s so good you’ll want to have this any day of the year. Don’t have a meaty ham bone? Substitute ham hocks, shredded ham, salt pork, or bacon. Don’t eat pork? Substitute a turkey neck bone or a meaty turkey leg. Don’t have chicken stock? Use vegetable stock. Want to make it spicy? Increase the cayenne pepper, add green chiles, or chopped jalapeno. Want to make it ahead? Keep it in the fridge covered overnight. Reheat on the stovetop or in a crock pot. Want it for a potluck? Place in a crockpot, as it makes it easier to transport and keep warm. Want to freeze it? Measure out 2 cups and place in a zip-top freezer bags. Craving more Southern side dishes? We’ve got you covered. Southern Collard Greens: these richly flavorful and tempting greens are flavored with ham hocks and smoked ham. 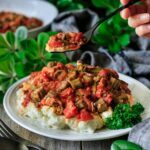 Skillet Southern Okra and Tomatoes: this mouthwatering comfort food is ready to eat in 1 hour. Skillet Cornbread: enjoy a big wedge of this slightly sweet cornbread in about an hour. Did you make these black eyed peas? Please leave a star rating in the comments below to share how you enjoyed it. 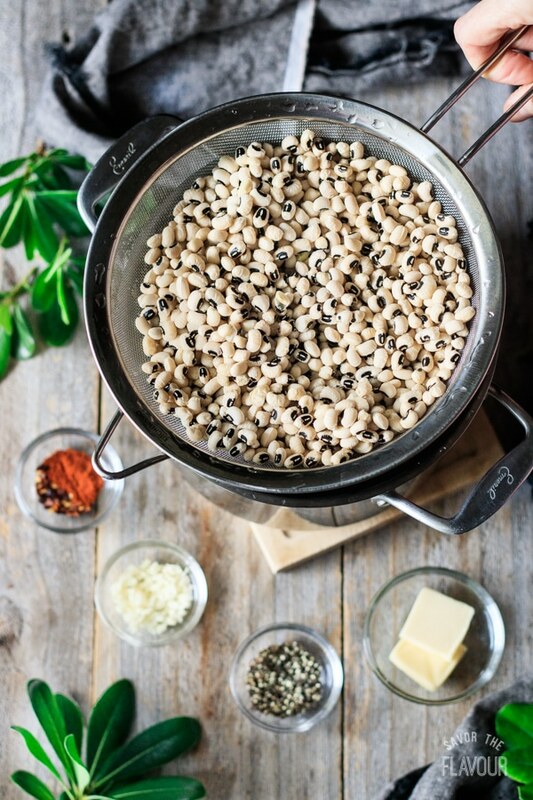 Black eyed peas is a popular Southern side dish that is traditionally served for good luck on New Year’s Day. Learn how to cook this healthy stovetop recipe for your special dinner. It’s easy to keep warm in a crock pot for church potlucks and open houses. Sort and rinse first. To quick soak the black eyed peas. Boil them for 2 minutes, then remove from the heat and let the peas soak for 1 hour. Drain and rinse the peas. Melt the butter in a large Dutch oven over medium-high heat until bubbly. Add the onion and cook until soft then add the garlic and cook until fragrant. Add the canned tomatoes, meaty ham bone, chicken stock, black pepper, cayenne pepper, and crushed red pepper flakes. Bring to a boil, then cook covered over medium-low heat for 30 minutes, stirring occasionally. Take out the ham bone. Let it cool and chop off the meat, reserving it for later. Cook the peas for another 30 minutes, adding a little filtered water or chicken stock if they get too thick. 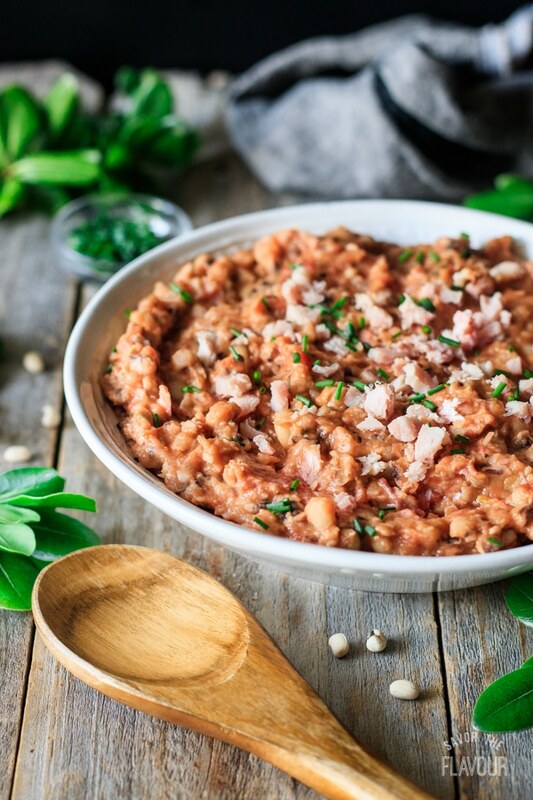 Stir in most of the chopped ham. Let rest for 10 to 15 minutes. Garnish with fresh chives and the remaining ham. Serve warm with cornbread and collard greens. Sort and rinse first then add to pot. Don’t pre-soak the black eyed peas. Add the quartered onion, smashed garlic cloves, diced tomatoes, spices and meaty ham bone. 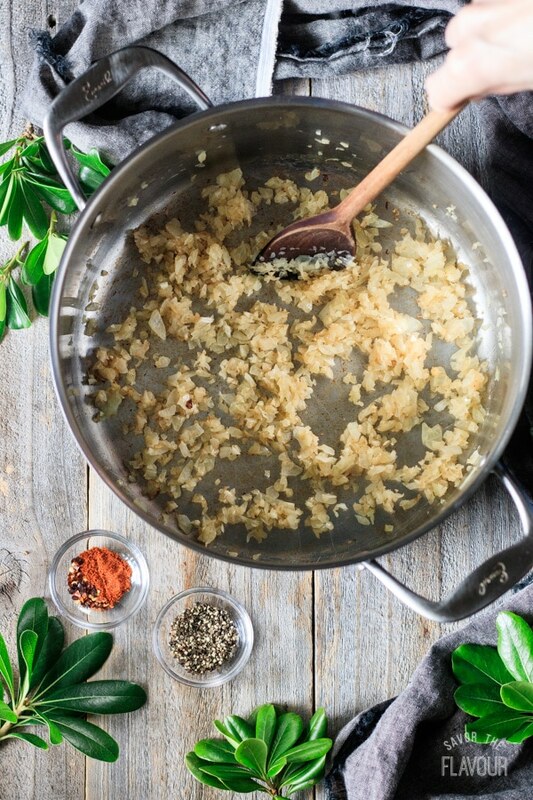 Pour in 6 cups of water if using an oval shaped crockpot, add a little less if it’s a standing pot shape. Cook on low for 8 to 10 hours. Remove the ham bone. Cool. Cut the meat off and return it to the pot.